In his early years a student of Dokuchaev and Mendeleev and greatly inspired by their example, Vernadsky would go on to a career rivalling that of his teachers in fame and influence. Vernadsky has increasingly been recognized as an important pioneer in the area of "whole earth" studies; it was he, for example, who popularized the term "biosphere," and who revolutionized biogeochemical investigations by looking at related components not only in isolation, but as parts of ecosystems. He is also credited with starting the field of radiogeology. 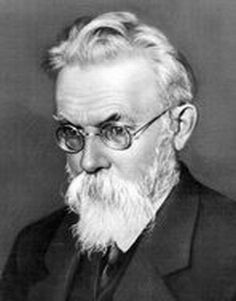 It was Vernadsky's belief that the biosphere as a whole was evolving, at once secondarily influencing geological evolution and slowly producing a new domain in which the human mind would become the dominant force, leading to a "noosphere." His numerous books and other publications treated related aspects of mineralogy, geochemistry, radioactivity, geology, crystallography, and soils. He was also a great teacher and international figure who travelled frequently outside of his homeland. Vernadsky's career was remarkable beyond the weight of his scientific accomplishments, moreover: despite his known anti-czarist and anti-Bolshevik sympathies, he somehow managed to navigate a political course through his life that neither got him into trouble with the ruling authorities, nor caused him to spend unintended time away from his studies. --born in St. Petersburg, Russia, on 12 March 1863. --dies at Moscow, on 6 January 1945. --Geographers: Biobibliographical Studies, Vol. 7 (1983): 135-144. --American Mineralogist, Vol. 32(3-4) (1947): 181-188. --Nature, Vol. 155(3932) (1945): 296. --Science, Vol. 102(2653) (1945): 439-440. --Archives Internationales d'Histoire des Sciences, Vol. 50(144) (2000): 160-177. --Impact of Science on Society, Vol. 38(151) (1988): 283-296. --Russian Review, Vol. 40(3) (1981): 278-299. --Quarterly Review of Biology, Vol. 70(2) (1995): 193-203. --Slavic Review, Vol. 45(1) (1986): 20-37.